Followed by a readable version. 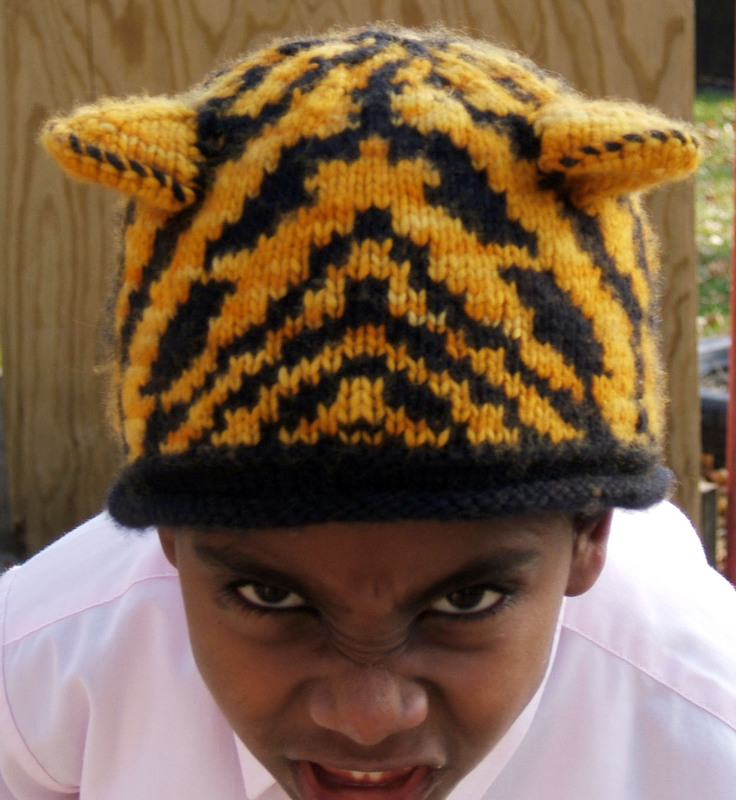 If you want the brand names, click on the pictures. You might need to know it’s Red Star Yeast. Ardythe Dey of Fort Calhoun Nebraska. What does this 16-year old plan to buy with her prize money? Black Angus cattle! Buttery-rich, no-knead dough wraps around a butter-pecan filling. Soften 1 packet of yeast in 1/4 cup warm water. Mix well. Cover; chill 2 hours or overnight. 1/2 cup firmly packed brown sugar. Divide dough into thirds. Roll out one part on a floured surface to a 12×6-inch rectangle. Spread with one-third of the filling. Let Rise in a warm place until light, about 45 minutes. Brown 2 tablespoons butter. Add 1 cup sifted powdered sugar and 1/2 teaspoon vanilla. Stir in 1 to 2 tablespoons evaporated milk until of spreading consistency. James Beard AND Art Linkletter will be there. This entry was posted in recipe. Bookmark the permalink. LOL! What a fun piece of history. How great! My husband did his student teaching in Fort Calhoun, Nebraska in the 80s, so that made your post even more fun for me. Have you seen Habetrot’s post this week? It’s about Eleanor Roosevelt. I thought you might like it since you have Eleanor in your header. We could use a few more who spend their prize money on cows. 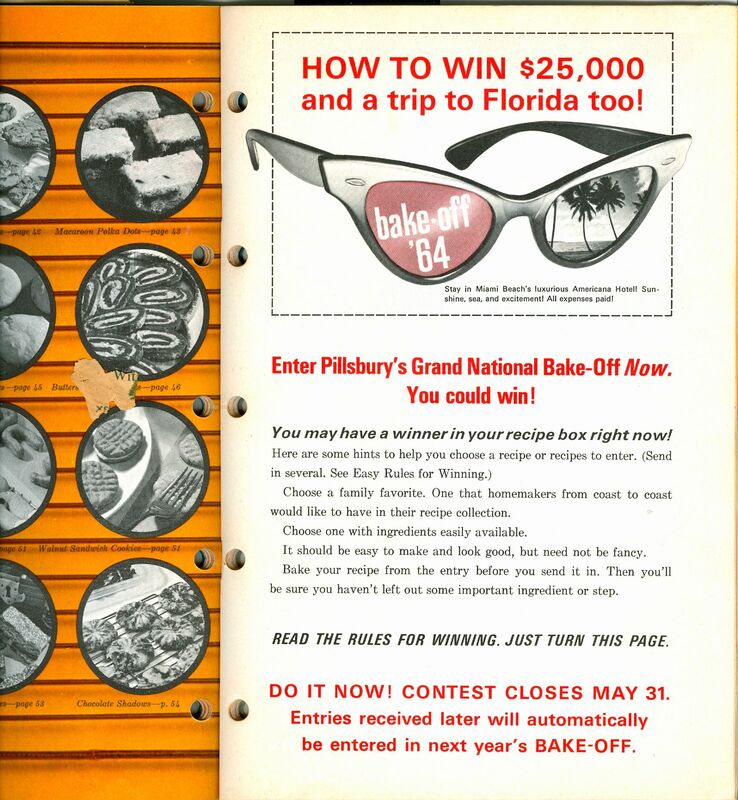 yum.Even yummer having seen the original recipe.I think I wanted the glasses that show the Florida prize trip. Thank you. I’m not going to wait until Christmas though. It’s looking like a weekend treat. What a hoot! It sounds sinfully good! Sounds absolutely fabulous. I really have to try this, thank you for posting it! I just wanted to tell you I made this for my co-workers a couple days ago, and they devoured them! I left the raisins out, because I work with a couple of raisin-haters, and I also changed the filling a bit – I combined just the brown sugar and butter, and smeared that on the dough, then sprinkled two rolls with nuts and the third with chocolate chips. It was all wonderful -thanks for sharing! Who doesn’t spend their prize money on a cow or two? That’s a great piece of times gone by. James Beard and Art Linkletter? Too cool! What a pairing. WOW! 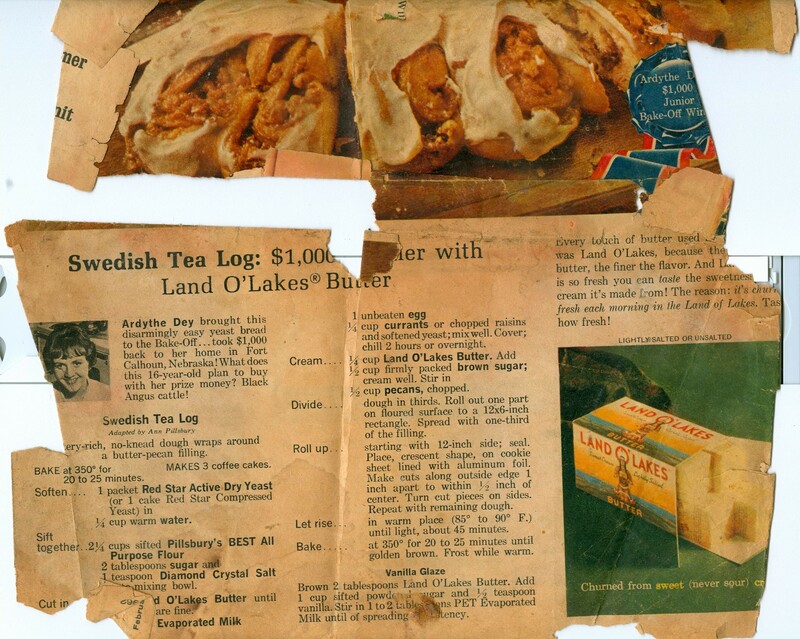 I have this treasured original recipe from 1962 in my cookbook and I have made the tea log for my family Christmas breakfast every year since then! When I cut out the recipe, I was a young stay-at-home mother and now am a Black Angus cattle producer and a great-grandmother! I surely would like to contact Ardythe Dey. $3,610 raised as of December 1, 2016. Thanks to all of you! Turoa Mitts Loft Skein Winner! Substituting Yarn for the Turoa Mitts from Drop Dead Easy Knitting and a Giveaway.